We can't mention toy storage without talking about Lego. Picture the (all too familiar) scene: it’s a Saturday morning. You have finally found some quiet time for yourself and are heading for the sofa, coffee in one hand, toast in the other. As you take your first step, you feel a tiny, but incredibly painful, stabbing in your foot. Coffee goes down your front, toast falls to the floor (butter side down, of course) as you hop around the room. You look down to assess the damage and find four tiny red dots imprinted on the sole of your foot. Lego, we meet again. Fear not: we have plenty of Lego storage ideas that will help you get those unruly bricks under control. There seems to be two very different schools of Lego storage – the incredibly organised, store everything separately by shape, size and colour method or the keep it all together in one big colourful mass method. Which is better? It depends on your (or less realistically, your child's) level of organisation. This storage bag from Kidly is definitely aimed at the bag-it-up school. The drawstring bag is designed to open out into a mat for your children to play on, when they are done, you can scoop it all up in a matter of seconds. Smart. This pouch just says it all. But fingers crossed Jack’s enemies (or you) will no longer be getting Lego stuck between their toes because all of the pieces will be neatly zipped away. From Not On The High Street, this pouch is large enough to fit plenty of bricks for on the go – perfect to take on long car journeys, to sleepovers or meals out. If your kid is serious about Lego, there really isn’t much point in putting everything away at the end of a play session. So why not find wall space in their bedroom to create a Lego workshop? This storage system below is from Elfa but you can easily make your own with a small desk, some shelving units, boxes, and slide out bins, then add pictures or display past projects to add character. Alternatively, if you don’t have loads of room, try out a DIY Lego table, which comes with plenty of built in storage. If your child likes things to be just so, a drawer system that allows them to sort their Lego into colours, sizes and even shapes will be a dream come true. Here, blogger I Heart Organizing , has put Ikea's Trofast storage drawers to excellent use. More Lego than you can handle? A lidded box will keep it neat and, if it's just one of many toy storage boxes in your child's room, and it's see-through, it will make what's inside easily identifiable, too. This nine litre storage box from A Place For Everything has a removable divided section to organise pieces and plenty of space in the bottom to just throw everything in. Definitely aimed at the incredibly organised branch of Lego storage, flip out drawers are great for organising smaller pieces of Lego and are always accessible to tiny hands. Drawers can be removed from so there’s no need for your children to keep going back and forth while creating their Lego masterpieces. These flip out drawers are from The Container Store. Storing your tiny pieces of Lego in a bigger piece of Lego? Ingenious. Seriously though, they look great and are a fun way to keep everything stored away neatly. Just like the real thing, they come in different sizes and can be stacked together as your collection grows. These Lego blocks are from A Place For Everything. Mini-figures (or minifigs if you are a Lego veteran) look great on display, and there is something so satisfying about seeing them all lined up that appeals to the Virgo in all of us. Of course, they are still toys so it’s important to keep them accessible for action. These display cases have a hinged door for easy access and can be mounted to the wall to get those beloved minifigs off the floor. 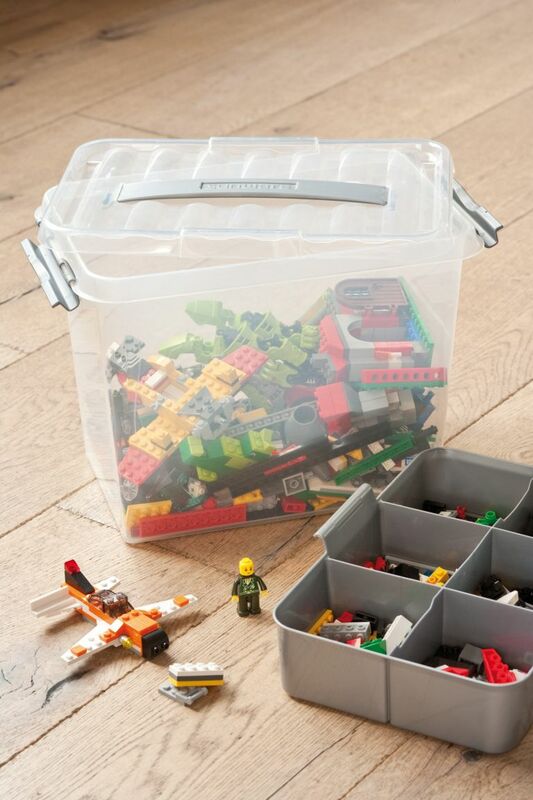 For the Lego sophisticate, a tool box is a great way to manage the pieces. The different sections allow for the Lego to be organised easily into different sizes, colours or purpose and the tool box's portability means your children can easily carry it around the house (yay, more rooms filled with Lego! ).